Vertebroplasty and Kyphoplasty are both minimally invasive techniques to place cement in vertebral compression fractures. The main purpose of either procedure is to minimize pain as soon as possible and minimize complications and side effects from more traditional treatment. The technical differences and implications between the two techniques are sometimes important and sometimes not so important. Vertebroplasty does not focus on restoring the smoosh in the vertebra as much as Kyphoplasty. If you should opt for either procedure, that final decision would be between you and your doctor. 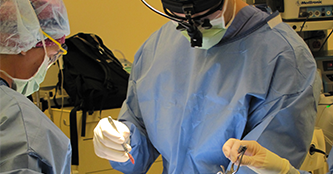 The procedure is minimally invasive as an outpatient with twilight anesthesia.